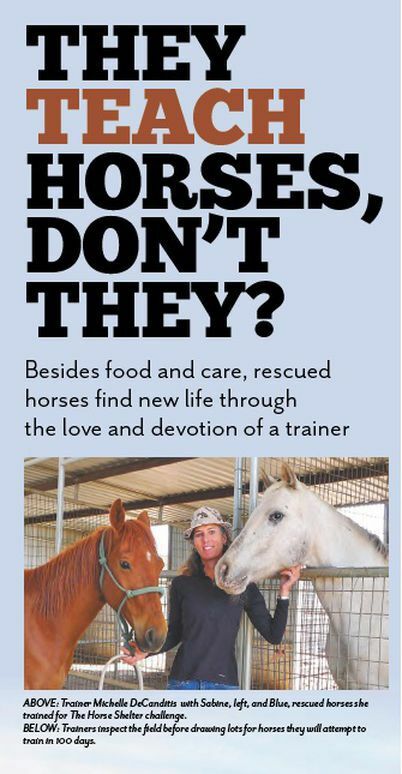 Adopting a horse from a rescue group, it seems, is not so different from getting a dog at the pound. You take your chances—but could easily end up with a best friend for life. Gazing into all those sad eyes, you search for a sign that separates one set from the others, and will one day open the story of how this creature came to be your destiny, your soul mate, your “Who rescued who?”—and not just any shelter pet. The difference between a dog and a horse, however, is that someone is going to come between that love-struck prologue and the forever after, and that person is the horse trainer. Yes, your new horse—like your children— has to first go to school and learn how to adapt to becoming a useful, well-mannered member of society of whom you can be proud. In the normal course of things, the trainer would meet the horse through her customer, who is you. But who is being served when the horse has no owner? The role of the teacher in the life of a horse is the focus of a new documentary by Donna Wells, whose film "She Had Some Horses" from 2012 was a study of women and horses. This time, Wells spends a year filming an intriguing project by The Horse Shelter, one of New Mexico’s largest rescue organizations for horses. “Gimme Shelter—Trainers’ Rally for Rescues” is a contest modeled on the reality-TV show Mustang Makeover and its sequels, which pair trainers with wild horses rounded up on public lands. The Horse Shelter’s version, now in its second year, sets the same 100-day training period followed by competition and auction, where all the horses get new homes. What intrigued Wells about the local contest, besides the fact that these horses had been rescued in New Mexico, was the focus she could put on the role of the trainer, and how they must fi t the complex needs of a living individual into a set of artificial constraints. It is a rehearsal for what the horse will go through when adopted. We spoke with one of the trainers, Michelle DeCanditis of the North Valley, who is competing for a second year. DeCanditis features prominently in Wells’ film because of what happened with her horse last year, a gray mare from Gallup named Blue. Blue had been at the shelter for four years, and was “a mess,” DeCanditis said. Judged to be about 8 years old, she was in reality (according to her vet) closer to 14. The trainer didn’t exactly choose Blue. She misunderstood the lottery process, and ended up with a horse that she later realized had really chosen her. The organizers, too, learned from her experience—repeated to some extent with most of the teams last year. A horse with history is like the unruly classroom in an inspirational-teacher movie: You fight, laugh, cry, and grow together, and then suddenly it’s time to let them face an uncertain future alone. Nearly all the horses last year ended up living within “eyeshot” of their trainers, DeCanditis notes. For this year’s event, The Horse Shelter chose young horses, 3 to 6 years old, in recognition of the reality that 100 days of training is nothing more than a solid foundation, even without the extra work of deciphering a horse’s history. Just as with dogs, it is for want of this foundation that many horses end up at a shelter to begin with. Uncontrollable and unwanted, they have never learned to operate within boundaries. Competition begins at 11 a.m., with horses available for adoption afterward. Exhibitions, entertainment, food vendors and merchandise.